If your vehicle has already been factory-fitted with towing equipment or is fitted with towing equipment from ŠKODA Original Accessories, then it meets all of the technical requirements and national legal provisions for towing a trailer. Your vehicle is fitted with a 13-pin power socket for the electrical connection between the vehicle and trailer. 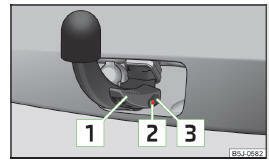 If the trailer that is to be towed has a 7-pin connector, you can use a suitable adapter from ŠKODA Original Accessories. The maximum trailer drawbar load is 50 kg. Check that the ball head is seated correctly and is secured in the mounting recess before starting any journey. Do not use the ball head if it is not correctly inserted in the mounting recess. Do not use the towing equipment if it is damaged or incomplete. Do not modify or adapt the towing equipment in any way. Never release the ball head while the trailer is still coupled. Take care with the ball head to avoid damaging the paintwork on the bumper. The ball head can be removed and is kept in the spare wheel well or in a compartment for the spare wheel in the luggage compartment » page 158, Vehicle tool kit. 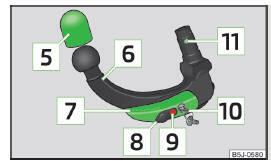 The tool for removing the wheel trim is part of the vehicle tool kit » page 158 . If you lose the key, please get in touch with a specialist garage. Always adjust the ball head in the ready position before fitting. Turn the key so that its red mark 1 » Fig. 119 is visible. Grip the ball head below the protective cap 2 . Press the release pin 3 as far as the stop in the direction of the arrow - at the same time push the lever 4 downwards as far as it will go in the direction of the arrow. The lever remains locked in this position. In the ready position, the key cannot be removed nor turned to a different position. Remove the cover in the rear bumper 2 » Fig. 117 on page 122 in the direction of the arrow using the tool for removing the wheel trims. Adjust the ball head to the ready position » page 122. If the lever 1 does not turn automatically, or if the release pin 2 does not pop out, remove the ball head from the mounting recess by turning the lever downwards as far as it can go. Clean the tapered surfaces on the ball head and the mounting recess. Lock the lock on the operating lever by turning the key by 180° to the right (see green marking 3 is visible) and remove the key in the direction of the arrow. Carefully remove the cap for the mounting recess - there is a risk of hand injury. Keep your hands outside the lever's range of motion when attaching the ball head – there is a risk of finger injury. Never attempt to pull the operating lever upwards forcibly to turn the key. Doing so would mean the ball head is not attached correctly. After removing the key, always replace the cap on the lock of the operating lever – there is a risk of dirt getting into the lock. Keep the mounting recess of the towing equipment clean at all times. Such dirt prevents the ball head from being attached securely. After removing the ball head, always place the cap on the mounting recess. Remove the cover from the rear bumper with care - there is a risk of paint damage to the bumper and the cap. Store cover 2 and cover 4 » Fig. 117 on page 122 in a suitable place in the luggage compartment after removing them. Check that the ball head is fitted properly each time before use. Lever 1 is up as far as it goes » Fig. 121. The release pin 2 is completely exposed (both its red and green parts are visible). The cap 3 is on the lock of the operating lever. The ball head does not come out of the mounting recess even after heavy “shaking”. Do not use the towing equipment unless the ball head was properly locked. Remove the cap 1 » Fig. 122 from the lock on the tow bar in the direction of the arrow. Unlock the lock on the operating lever by turning the key 180° to the left so that the red marking 2 becomes visible. Grasp the ball head from underneath. The ball head is released in this position and falls freely into the hand. If it does not fall freely into the hand, use your other hand to push it upwards. Fit the cover for the mounting recess 4 » Fig. 117 on page 122 in the opposite direction to the arrow. Offer up the cap to the rear bumper 2 » Fig. 117 on page 122 aligning it with “check mark” in the lower bumper area. Push the cap in first on the left and right and then at the top. Never allow the ball head to remain unsecured in the boot. This could cause damage in a sudden braking manoeuvre and put the safety of the occupants at risk. If the lever is held firm and not pushed downwards as far as it can go, it will go back up after the ball head is removed and will not latch into the ready position. The ball head then needs to be brought into this position before the next time it is fitted. Stow the ball head in the ready position with the key inserted in the box. When doing so, make the side opposite to the inserted key face downwards – there is a risk of damaging the key. Do not use excessive force when handling the operating lever (e.g. do not step on it). We recommend that you put the protective cap on the ball before removing the ball head. Clean any dirt from the ball head before stowing it away in the box with the vehicle tool kit. Close the mounting recess with the cap to prevent any ingress of dirt. Always check the ball head before hitching a trailer. Apply a suitable grease where necessary. Fit the protective cap when stowing away the ball head to protect the luggage compartment against dirt. In the event of dirt, clean the surfaces of the mounting recess and treat with a suitable preservative. Apply grease to the upper part of the mounting recess. Make sure you do not remove any grease.